As a parent, you are likely putting in significant effort to teach your children good dental hygiene habits. Brushing teeth twice a day, using mouthwash, and flossing regularly all lead to a healthy mouth. 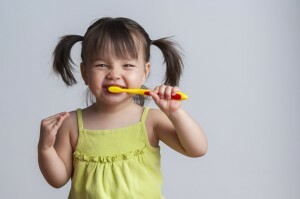 But sometimes even with all of these habits in place, your child can have bad breath. If you find that your child has a breath problem there are many factors you will want to consider, today we’ll walk you through five of the most common. Children are naturally curious and do not have the best impulse control, which is why small objects can often wind up lodged in their noses and ears. If something is to become lodged in a nasal passage, it can create a serious stink. If you believe that a foreign object might be the source of your issue, you will want to take your child to a doctor to have their nose examined and the offending item removed. Children are often easily distracted and may not keep up with staying well hydrated. Dehydration can have many side effects, including a decrease in the amount of saliva the mouth produces. Saliva plays an essential role in cleaning the mouth of food and bacteria throughout the day. When saliva production is decreased stinky breath occurs. If your child is particularly active or if you believe they are not keeping up with their water intake, start by making staying hydrated a priority. Children are often exposed to a lot of germs on a daily basis if they’ve caught a cold or illness that results in swollen or infected tonsils they may have bad breath as a result. If bad breath persists, use a flashlight to check that the tonsils look pink and healthy. If you notice any swelling, spots or soreness call a doctor to check for issues. As with tonsil problems, sinus infections can cause bad breath because of the build-up of nasty bacteria. If an illness like a sinus infection is the cause of the issue, it won’t be resolved by toothbrushing alone. In some cases, these illnesses will require medication to clear up, make sure to see a doctor to find the correct treatment. Regardless of how well you teach your children about brushing there will always be instances where tooth rot occurs regardless. Kids often do not want to brush their teeth and might be doing a less stellar job of practicing tooth health than you’d think. Additionally, some cases of childhood tooth decay and gum disease stem from diet, genetics and other issues. If you suspect that this might be the case, schedule an appointment with your dental professional. At Catonsville Dental Care, we aim to make your dentist appointments quick and easy. With four dentists, you won’t be able to find a better provider for your teeth and gum health. To schedule an appointment or consultation, visit us online or give us a call at 410-747-1115. For more tips and tricks, be sure to follow us on Facebook, Flickr, Twitter, Google+, and YouTube. This entry was posted on Friday, February 1st, 2019	at 8:43 pm	and is filed under Pediatric Dental Care in Maryland	. You can follow any responses to this entry through the RSS 2.0	feed. Both comments and pings are currently closed.